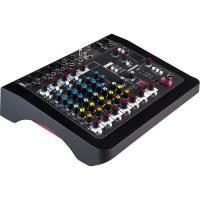 Designed to bring the signature Allen & Heath sensibility to a compact and portable frame, the ZEDi-10 is a six-channel compact mixer that doubles as a USB interface. 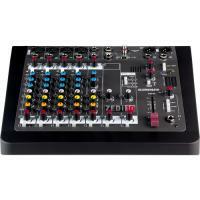 On the mixer side, you get four XLR inputs, four line inputs, two instrument ports, and two pairs of stereo line inputs. Utilize this unit's digital capabilities and you'll find yourself with four channels of conversion—analog-to-digital or vice-versa. 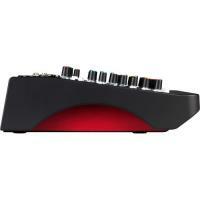 Thus, you'll find the ZEDi-10 equally suited for live-mixing in small venues and for tracking instruments on the fly. Should you choose use the unit as an interface, you'll find that it comes with Cubase LE, a digital audio workstation which enables you to record, sequence, and edit music, be it audio or MIDI. In the analog realm, the ZEDi-10 is crafted with preamps modeled on the Allen & Heath GS2-R24. These channel strips aim to provide warmth, low noise, and a vast expanse of headroom. On-board EQs also come standard with the unit. Two channels feature a button that converts line-level signal into high-impedance jacks, meaning guitar players need not lug an extra DI box around should they wish to go direct into the board. Turning your attention back to the digital side of things, you'll notice that a USB switch controls the routing of your USB output, enabling you to select how you route and separate the incoming analog signals into your DAW. Box Dimensions (LxWxH) 18.0 x 13.0 x 5.5"